Click the button "Add Files..." to browse and select MP3 or WAV files. If you want to remove some unwanted audio files from the list, you may check the files and click the button "Remove". Please choose a normalize value from the drop-down list under the button "Normalize". The value may be from 1 to 100. The bigger is the value number, the higher is the volume. If you want to overwrite the old files, please set the radio to "Overwrite Original Files". If you want to save the normalized files to a new folder, then please set the radio to "Save to Another Folder", and select a folder by click the button "...". 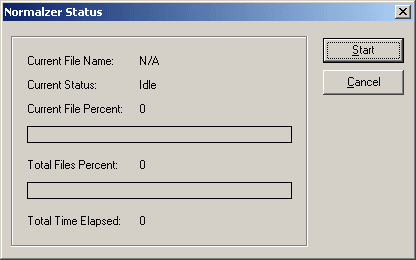 Click the button "Start" to start normalizing. Click the button "Cancel" to cancel normalization.